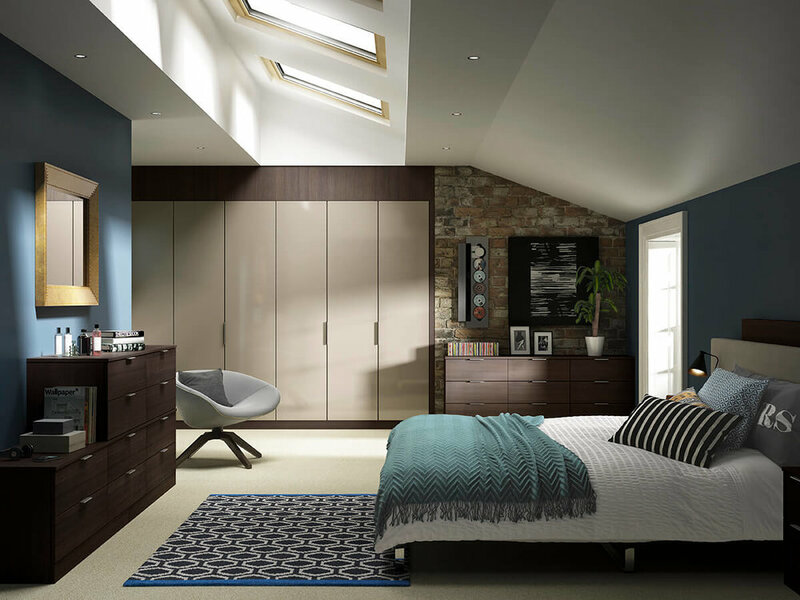 Bedroom Gallery is well-known for providing client with bespoke fitted bedrooms, fitted wardrobes, sliding wardrobes & more in Stourbridge . Contact us on 0121 350 9555. 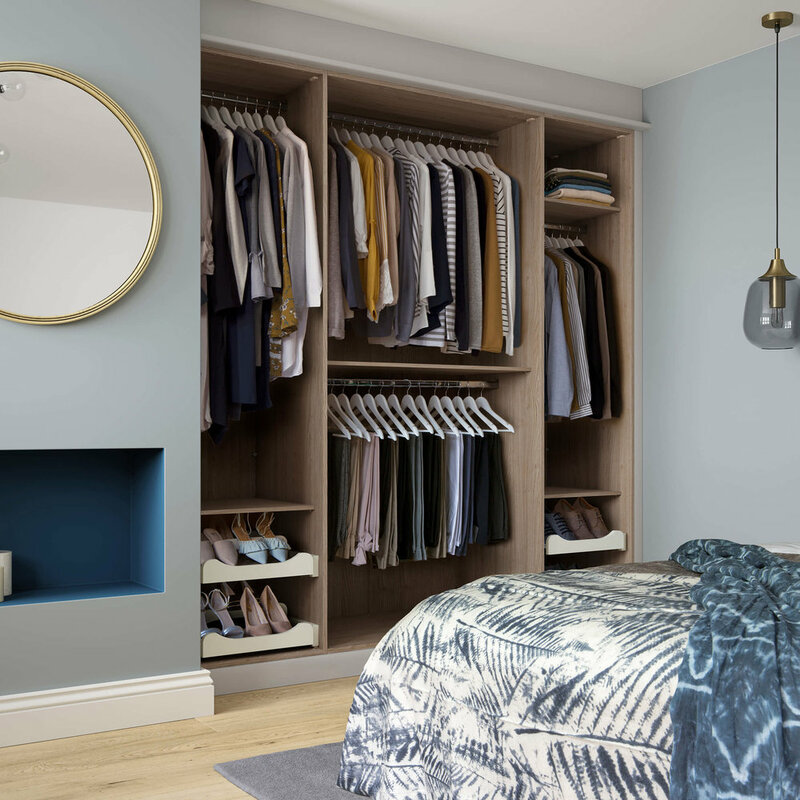 From a grand walk-in wardrobe to luxury master bedrooms, Bosworth conveys a quintessentially classic design. Available in nine finishes, ranging from wood shades to clean white, with a rustic iron handle, Bosworth produces the feel of timeless quality. The level of detail on doors and mouldings sets Bosworth in a class of its own, the essence of sophistication. Smooth lines with curved edges give Milan that chic feel befitting of the city it was named after, distinguished and everlasting style in nine different colours and textures. With two modern handle choices and its neat minimalistic finishing, Milan offers you decades of being on trend. Smart, classy and sharp. 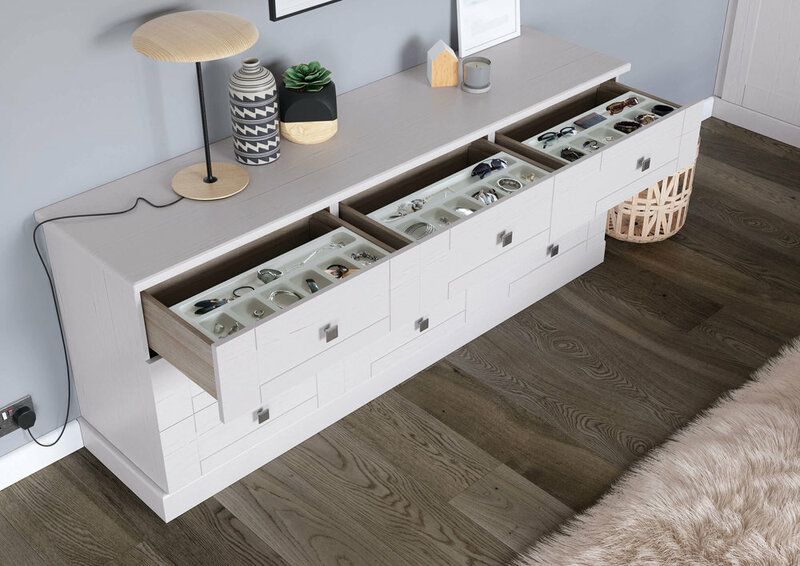 The Kingsbury will breathe light and freshness in your room, fitting all backdrops, modern or classic rooms will benefit from concise complete design, simplicity is key in this definitive shaker. 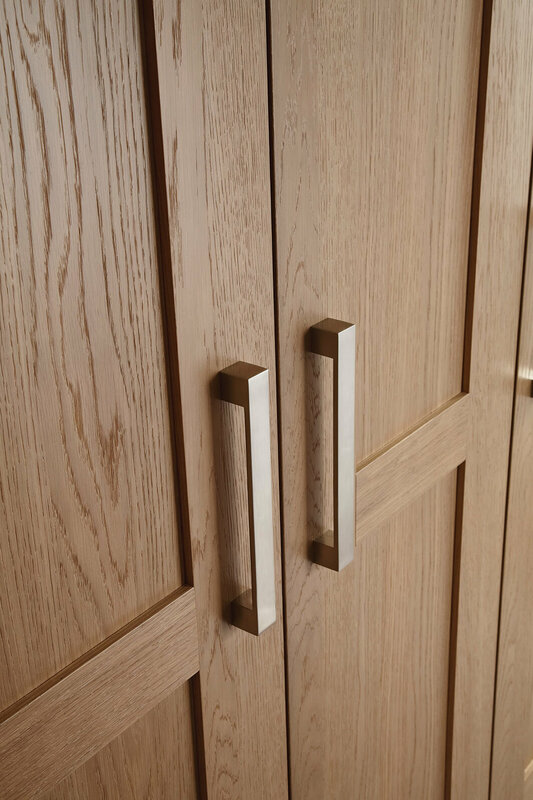 Kingsbury is available in nine finishes including textured wood grain. This carved door design is an instant hit, Harewood will outlive all other styles and fashion trends, to give you years of bravura. Rich in character, timeless styling, available in nine finishes to suit your room theme. Gloss gloss on the wall, who's the shiniest of them all? Lustro is gloss in all its glory, with a deep vibrant reflection bringing a breath of freshness to your room. 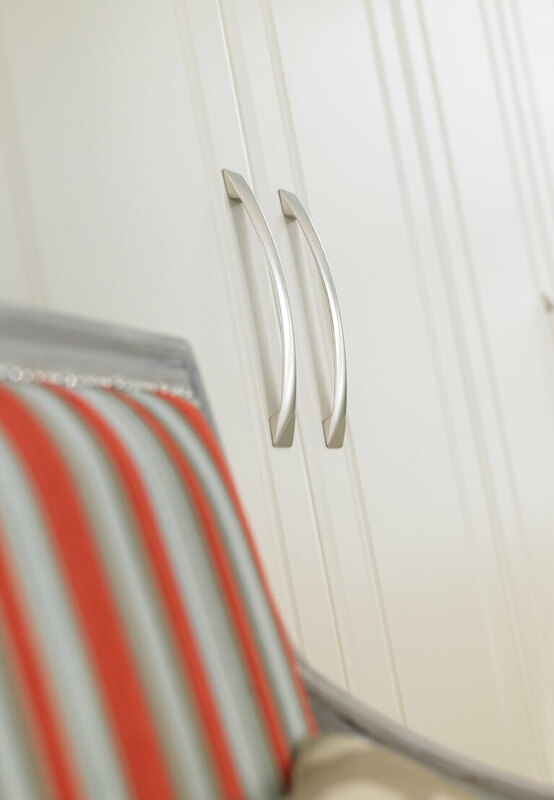 Contemporary sleek lines with minimal fuss, complemented with a colour matched tab handle to complete the look. Subtle and stylish, the Solo range infuses contemporary living into any environment. 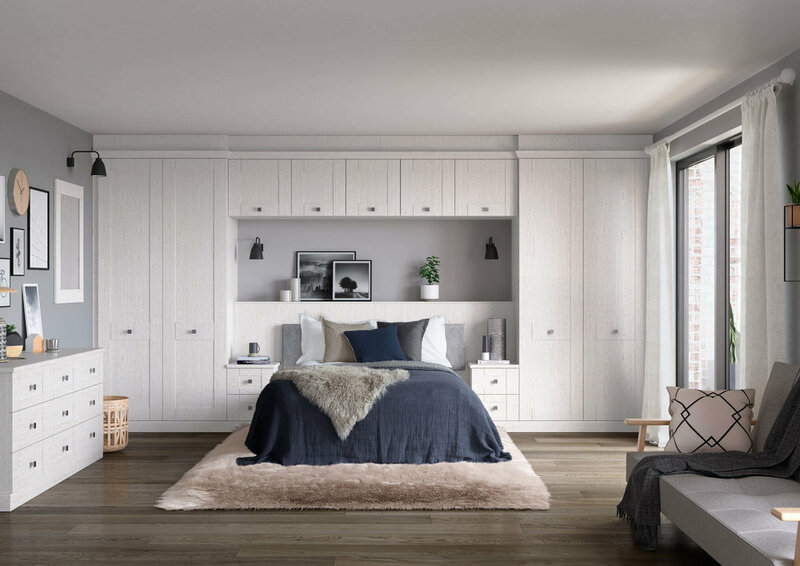 With nine colour options, the solo range is the perfect pick to create that uncluttered feel to your bedroom. Soft curves in the delicate detail of the Prima range conveys the universal feel of this subtle beauty. 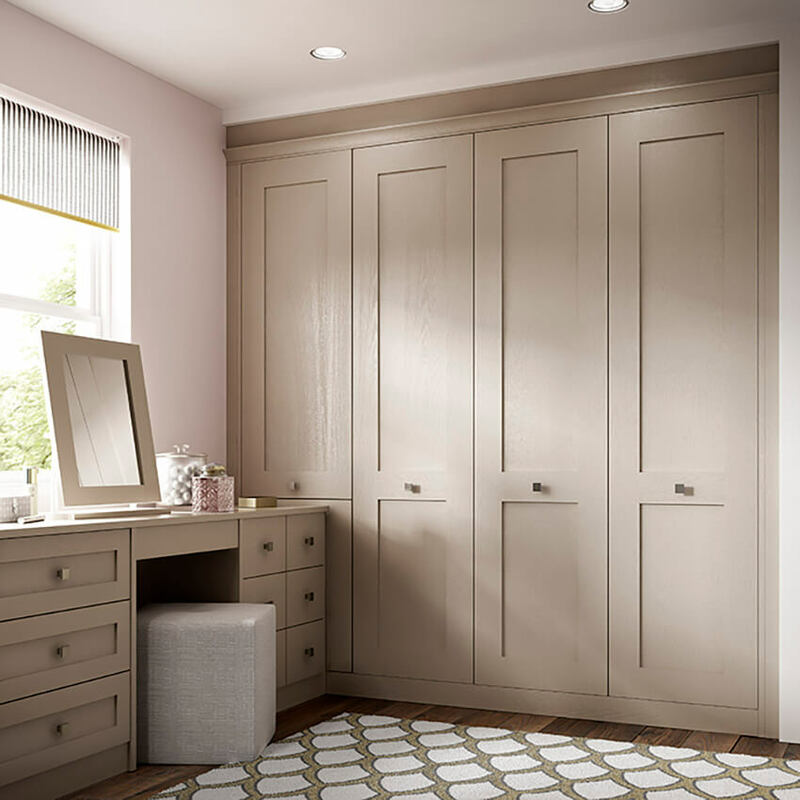 The minimalist feature of this door will aid you in decorating the rest of your room, completely versatile, available in eight finishes. Sharper, timeless style, the square indentation pattern in the door makes Prima square a classic hit. Available in three distinctive finishes. If you're looking for that premium finish, look no further, hand painted, hand finished with extra added elegance. Pick from two styles that both bring an abundance of charm and charisma to your bedroom. 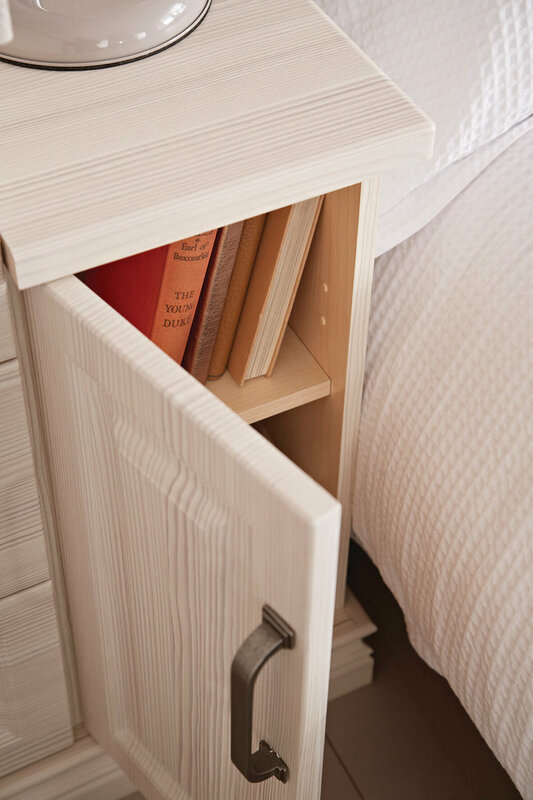 Milton is hand painted to perfection, soft satin finish compliments the pure wood grain in the door beautifully. 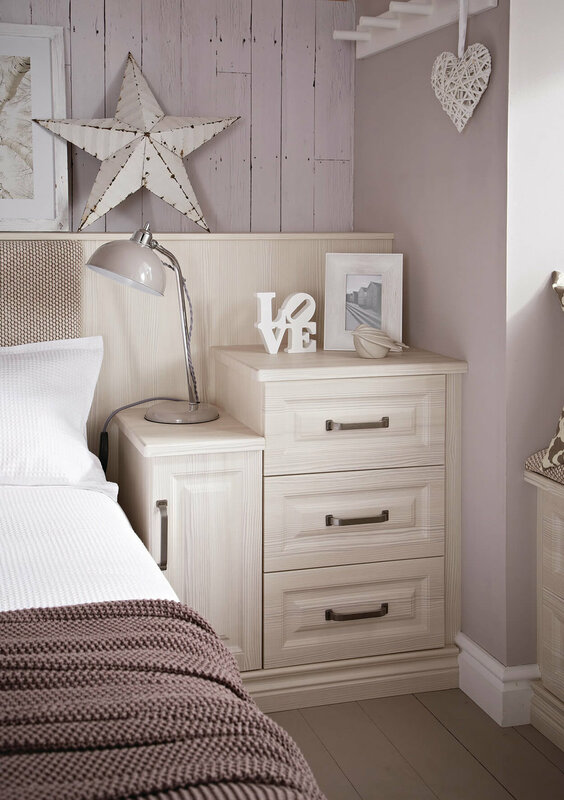 Available in five unique painted finishes, each bringing its own elegantly modern theme for your bedroom. The timeless shaker like you have never seen it before. 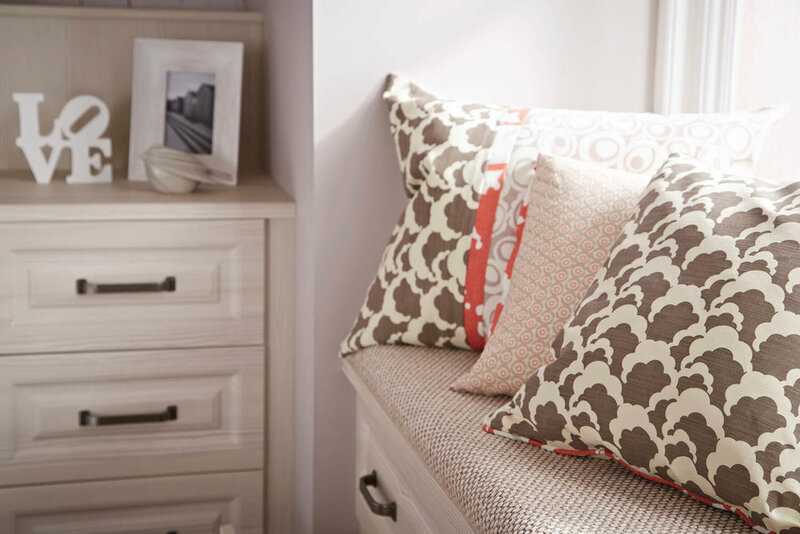 Charlotte is designed to create a characterful richness. 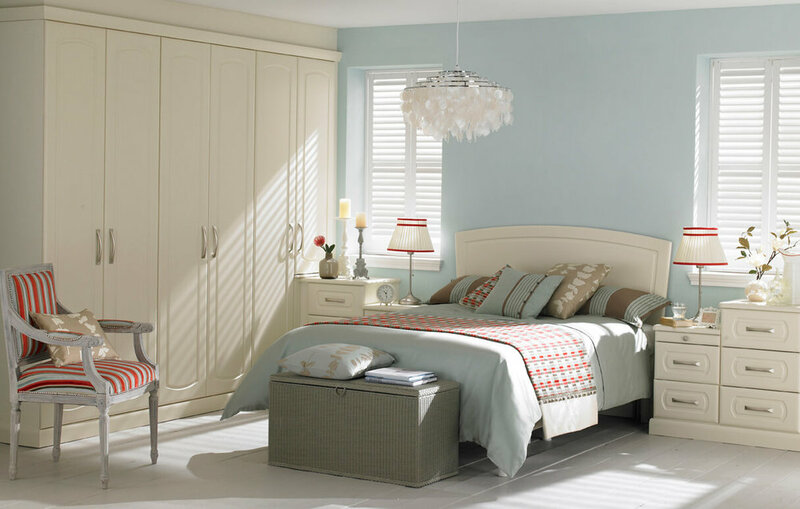 Hand-painted in soft white, this opulent range of furniture is perfect for that grand bedroom or walk-in wardrobe. Draped in Swarovski crystal, the door handles intensify the theme of pure luxury, finish off the look with plain painted white doors, glazed laced doors or tall mirrored doors, each bringing its own touch of sophistication to your room. 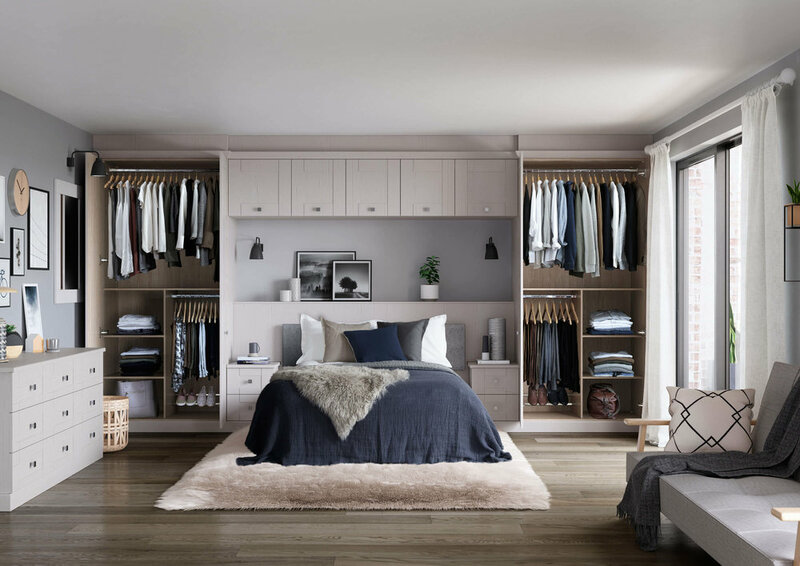 Moda brings all the texture and grain of glorious wood shades and combines it with ultra-modern design. 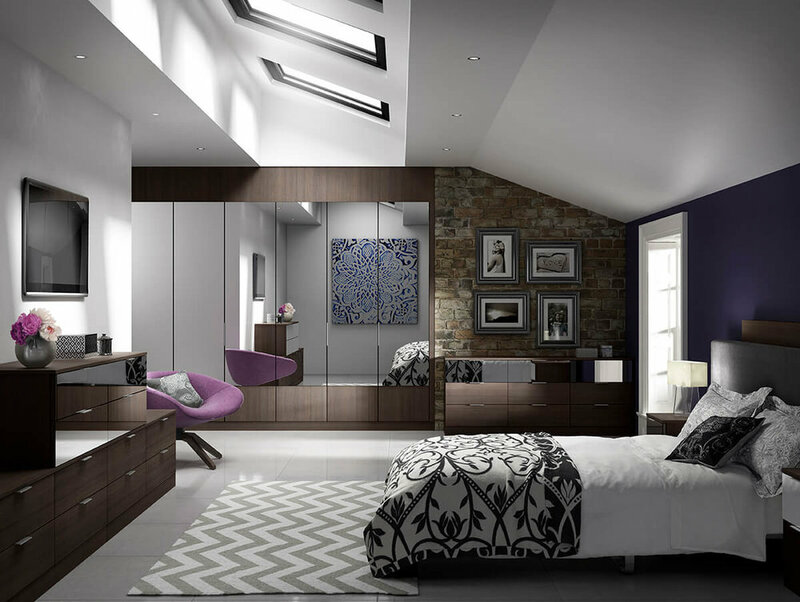 Gloss and mirror are used to complement the wood surround to create your own style. 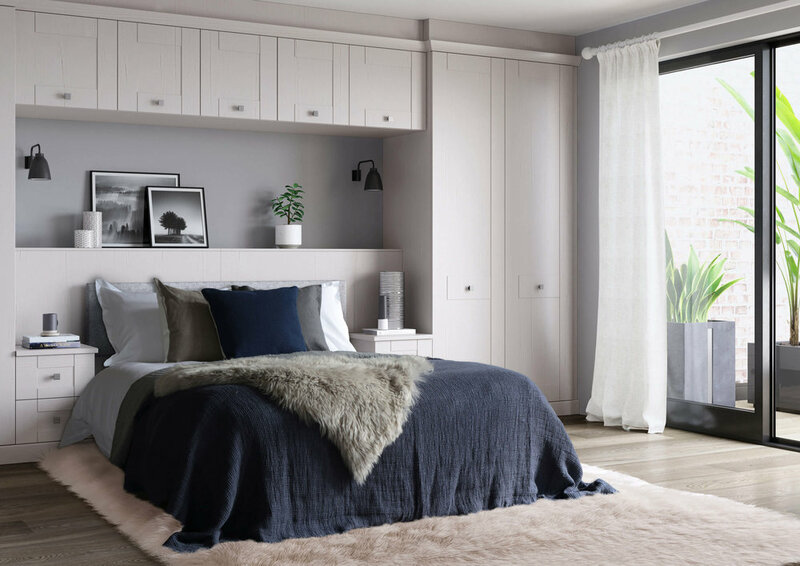 Moda offers you three frame finishes in Dark, Medium and Lightwood shades, the same colours can be used for the doors to create a seamless minimal feel, or you can combine any one of eleven facia colours to put a truly individual stamp on your bedroom. Why not bend the rules with curved doors? Available in full height or for your dressing table. Split finish doors add a further customisation option, the possibilities are endless. 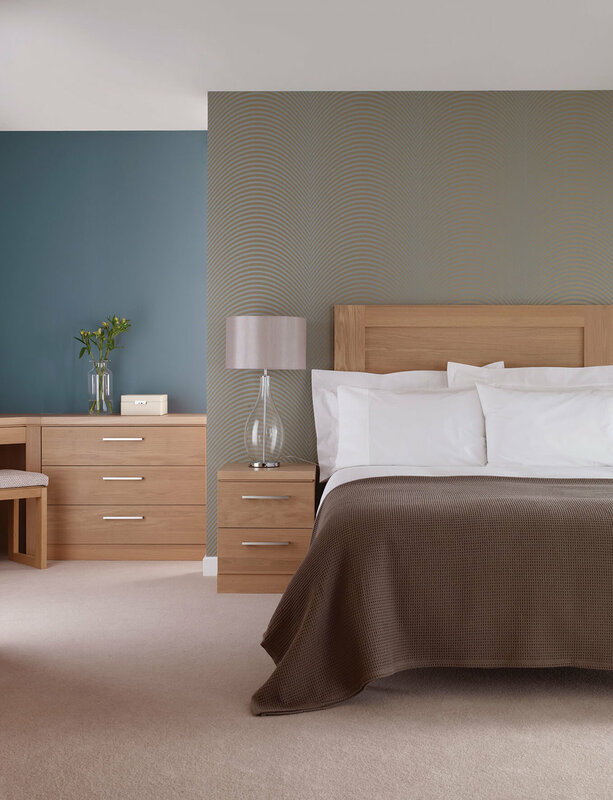 Moda dark will transform any room into a contemporary place of tranquillity. Shown here with a split finish and mirrored doors, you could even use a mirror for the draw frontals, pure luxury. Use Moda Dark as an outer frame colour and create your own masterpiece, with gloss and matte finishes to use, you can mix and match to your desire. 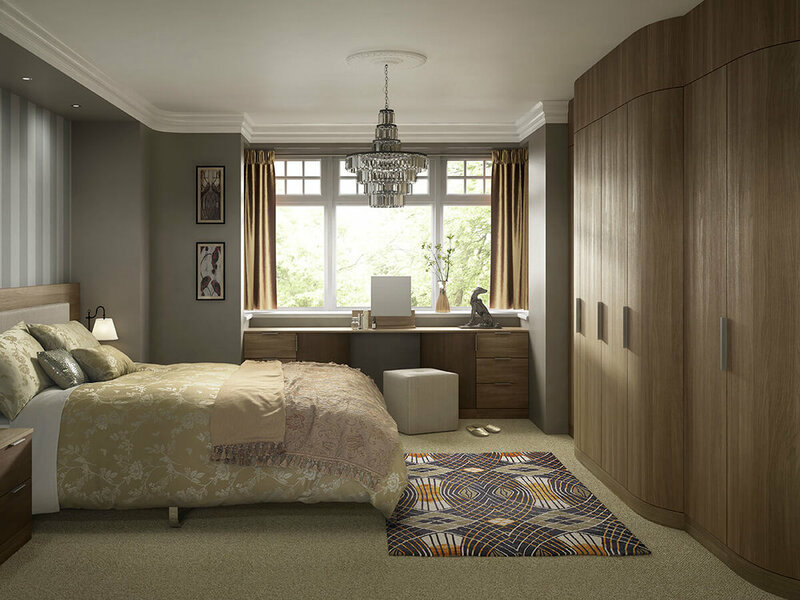 Smooth Modern texture, Moda Mid Tone is a truly versatile bedroom range. 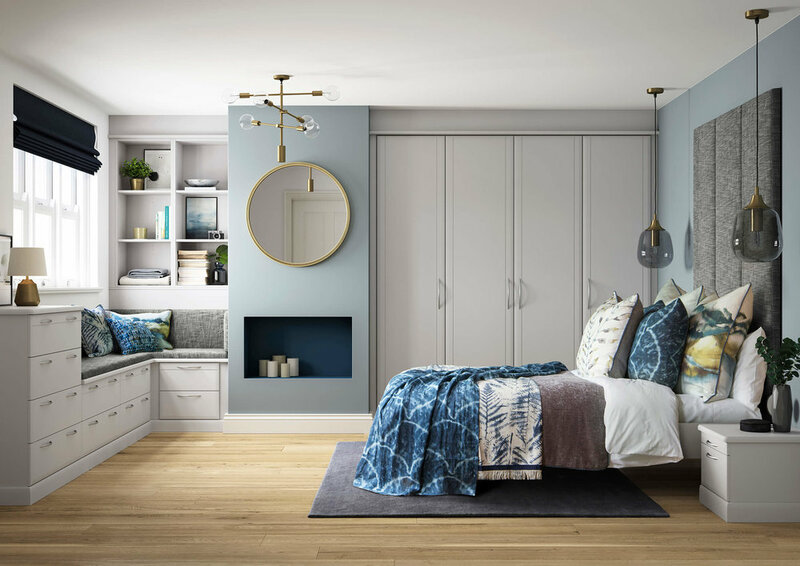 Use the Moda colour options to create a striking contrast or opt for a colour matched door to take advantage of the contemporary feel of a subtle Moda effect. Bright and modern, Moda Light is a distinctive light wood grain capable of blending into any room-set. 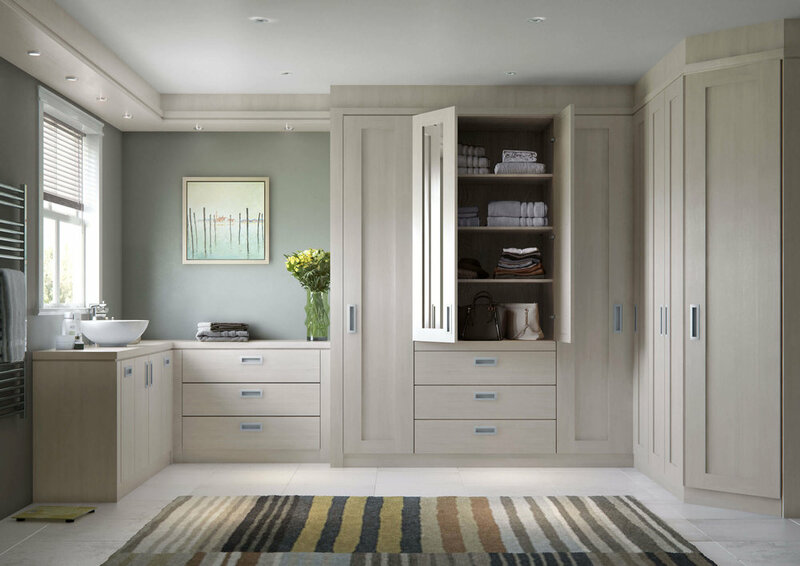 In a world where so many will offer you poorly finished, characterless doors, it's a real relief to see a range of pure wood, a range of the highest quality veneers, handcrafted, and hand assembled, we offer you a range of beautiful furniture that has the stamp of approval of the craftsmen that created it. Look out for the variation in the grain accustom to natural products, the real wood veneers range, natural luxury in your home. 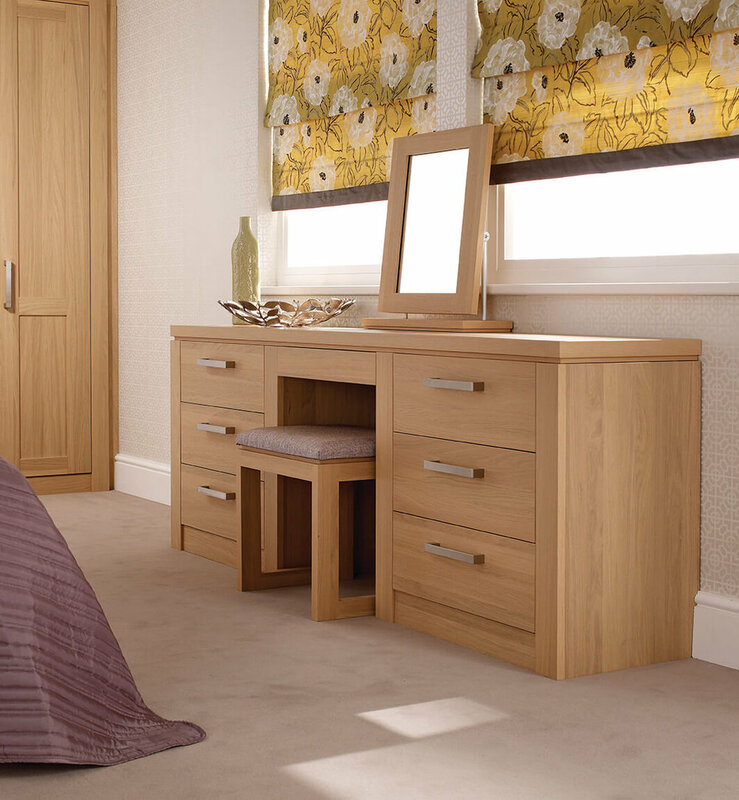 Luxury real wood, hand stained and assembled, the Albany range creates that timeless style but with real wood veneer. 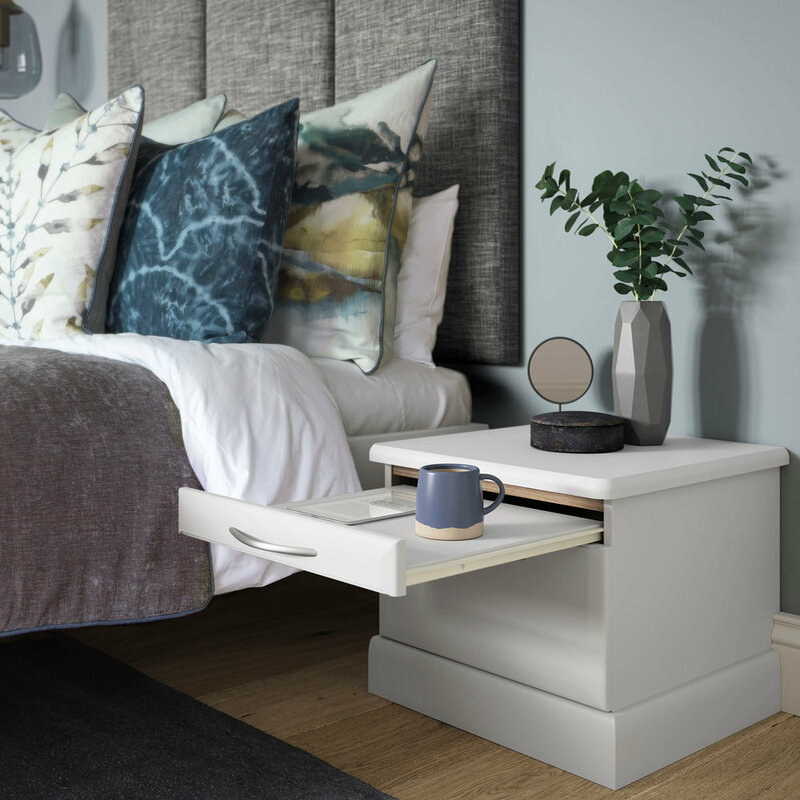 The full range of furniture available in the Albany range will set your bedroom apart, from the 52mm worktops to the pilasters and brushed steel handles, create your own subtle masterpiece. Available in 5 real wood veneer finishes, Albany works well in a modern or classic setting. 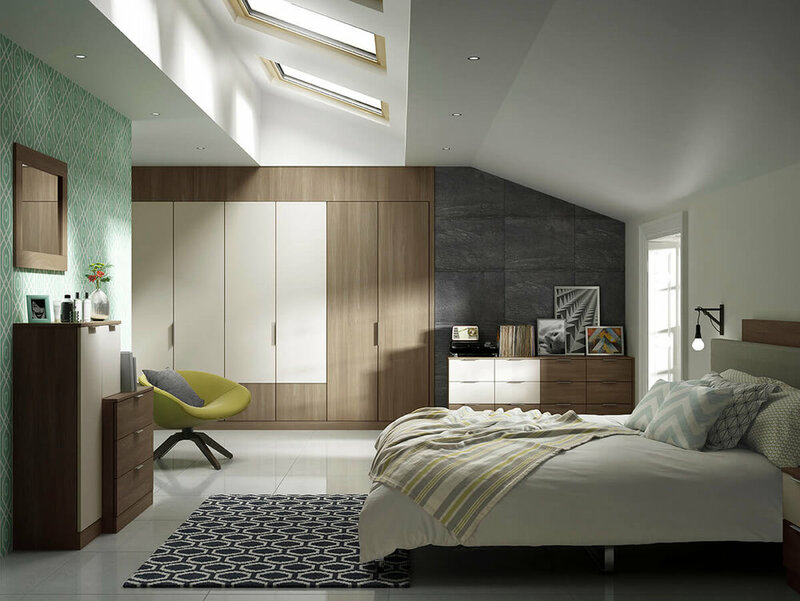 Clean lines and the natural attractiveness of the Linear range gives your bedroom that uncluttered look. 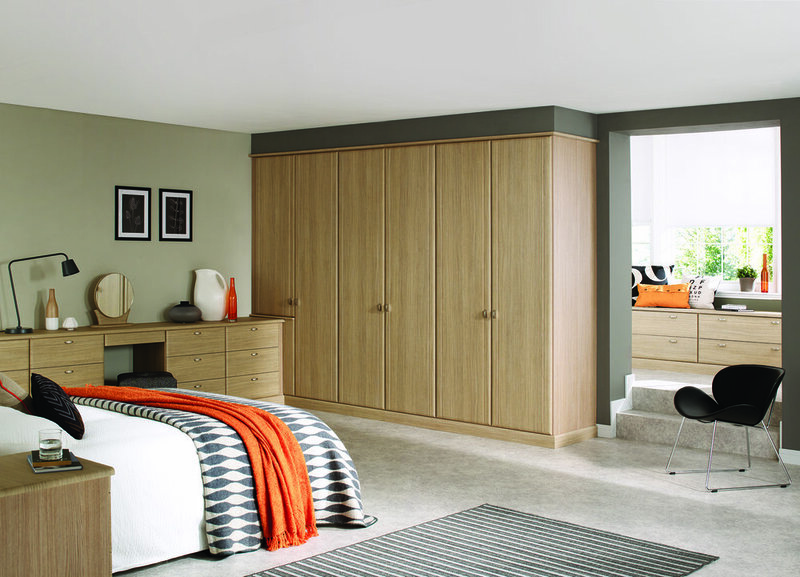 Available in 5 real wood veneer colours, with doors over 2meters tall, Linear is quality simplified.